Get your DIY hat on for this one! There’s a few easy, yet big impact projects here for you to copy. Buy this $8 Paris Map wrapping paper sheet. Find a frame that’s inexpensive and sized to accommodate the poster; try Target, Aaron Bros., or Amazon for this. I couldn’t find one that allowed for either an even border or no border so I got a cheap mat cut at Aaron Bros. If you don’t want to add a nail hole to your wall, just lean the frame against the wall instead of hanging it. You could skip framing entirely and simply use paint safe double stick adhesive; just be careful when storing the poster afterwards as the wrapping paper gets torn easily. Keep your eyes out for other cool sheets of wrapping paper. Cavallini makes many other similar sheets—I have an Italian-themed one and a vintage alphabet one that I use at parties too. Paper Source and museum gifts stores generally have a good selection. Simply get a round vase that’s about 1.5″ narrower diameter than another, set the smaller inside the larger and fill the gap with conversation hearts (or any candy you like). I found my vases at Target but any similar store will have them. If you want a more in depth step by step, check out this post on Refresh Restyle where she uses the same technique but with sliced fruit. Note there it did take a bit of fussing to get the type side of the convo hearts pointed the correct direction and it helps to have another set of hands around to do it. Grab some pastel roses that coordinate with the candy, make a bouquet that fits inside the inner, smaller vase and trim stems to fit; to exactly copy my arrangement, add a few sprigs of greens if you like but it’s not needed. Be VERY careful not to get water on the candy as you fill the inside vase or you’ll end up with a big sticky blob of candy! I wanted height in my display so I simple turned a clear vase upside down to use as a riser but I’ve used upside votive holders and water glasses for other displays. I recommend Quake Hold to be sure the display is secure. Valentines honeycomb tissue centerpiece adds a special focal point and is a vintage one picked up ages ago, but find similar: check out the selection on Etsy and Amazon has a cute new version. Bargain antiques are everywhere: keep an eye out at thrift stores, garage sales (live and virtual), antique malls and flea markets. The set of milk glass luncheon plates I found on a Yahoo moms group, the silver-plated bride’s basket was an antique mall find, the set of glasses are from Goodwill, and the glass compote, glass cakes plates, champagne bucket and menu plaque are flea market scores. Most of these were in the $20 range! Opt for inexpensive decorations that come already assembled. When shopping at Amazon and other bargain retailers, go for the pre-done decorations instead of the ones that require hours of assembly! I’ve made the mistake of not reading directions online and getting sheets of tissue paper that require an hour of work to end up with a simple decoration. I found the above no DIY needed Conversation Heart Banner on Amazon that tied the floral arrangements together perfectly. Balloons (that last 1-3 days with ‘highfloat’) are the ultimate big impact, low effort option to use so don’t forget to pre-order them for easy grab and go decorations. Use food and drink as decorations by choosing things based off of color and provide mostly store bought things to make your life easy. Rosé wine or sparkling wine is an obvious choice to add just the right pink color! Starbucks has fantastic white and pink chocolate heart cookies right now (shown) and Valentines cake pops as well. I had an epic fail of separated globby frosting last time I tried to make strawberry buttercream so I wasn’t up for making the cupcakes; I ordered them ahead from Vashon Island Baking Company and they were as delicious as they look 🙂 The raspberries were on sale at Target as were little butter cookies. 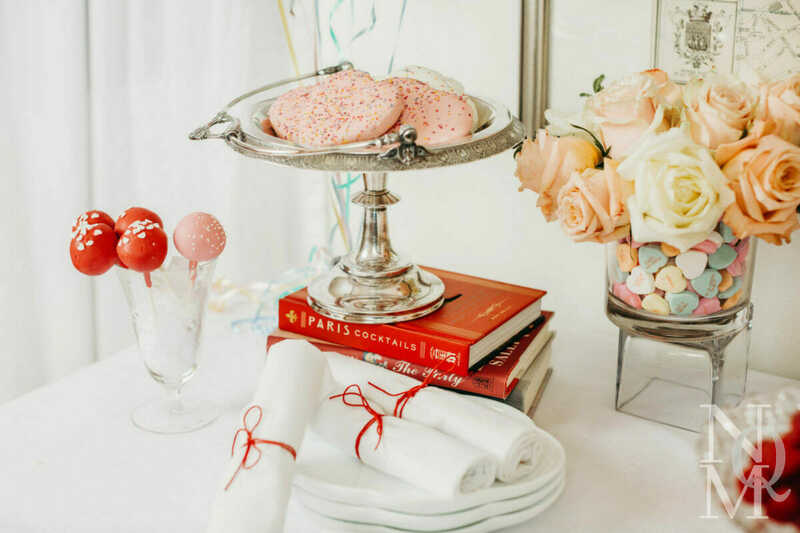 Tip on displaying cake pops: use a cup or vase stuffed with a bit of white tissue paper as filler in order to keep them separated and looking cute. Small additions to napkins and tablecloths add a lot of pizzazz for very quick effort. I took a plain white tablecloth and added fun swags by gathering swags with safety pins on the back front area and then pinned blue ribbon on both sides and tied a simple bow to create the tie up look; here’s a YouTube tutorial on swagging. For a cheap disposable option, try Targets cute scalloped-edge white table cover. Plain white cotton napkins were spruced up with a quick double wrap around and bow in red hemp cord but any red twine works well.